Three-toned geometric minimalism, with a soft touch. This scarf is also available in hot coral and in black. 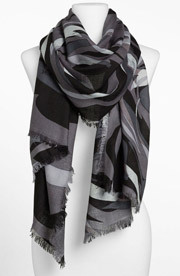 The size makes this scarf very versatile, as it is large enough to wear in a multitude of ways. It’s lightweight so nice for warmer temps. The arty striped pattern will work well with solid tops and jackets, but can just as easily be used for a fun bit of pattern mixing. It’s also available in a black-white-yellow stripe — great to create a strong graphic vibe — and in hot pink. 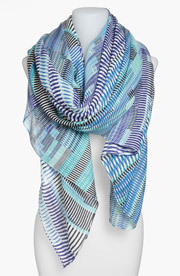 This beautiful scarf is soft and has a subtle silky finish. 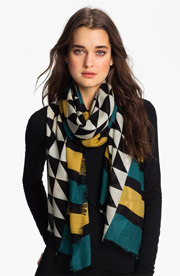 The bold geometric pattern will add a colourful graphic vibe to all your coats. 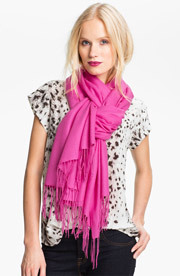 Of course this is not an “outerwear scarf” only, so there’s no need to take it off once you are inside. Also available in Red/Brown. Speaking of a conversational print! This square silk scarf with a photorealistic print of one of New York City’s most famous landmarks will undoubtedly get you noticed. A great size for different tying techniques and a fun way to add flair to both dressy and casual outfits. Also available in oatmeal. Be sure to check out the “Eiffel Tower” version too. This 100% wool scarf has a silky finish, eyelash fringe and is a good size to play around with different ways of tying and draping. The beautiful abstract pattern feels arty and slightly mod, with each of the four colourways creating a different vibe. Wear it outdoors with your Winter coats or keep it on indoors, throw it on over a blazer, pullover or blouse to add colour and a touch of flair to any outfit. This soft wool/cashmere blend wrap has been an extremely popular item at Nordies for several years, and with good reason. It is a great quality piece that comes in a fantastic array of beautiful colours. Thanks to the fab length it can be worn in many different ways for both dressy and casual occasions. Super handy for travelling as well. Lots of clients have this one, and the numerous positive online reviews are further testimony to its all-round fabness. 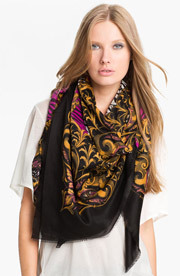 This lightweight scarf has character and versatility. The exotic pattern intermingles with ornate scrollwork and looks wonderful in all three colourways. Wear it in a sophisticated way with dresses, blazers or shirts, or try a spot of pattern mixing with a striped top and add a subtle rocker vibe with skinnies and ankle boots or moto boots. 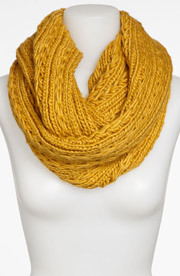 A cosy infinity scarf that slips easily over the head and is not itchy at all. The chunky sweater knit is great if you’re in the mood to try out the big scarf look that is trending this season but don’t want to go too bulky. Pop it on over a leather jacket, or a woven or knit blazer in a solid colour or a fab pattern and you’re good to go. This fun scarf will add great textural interest and is available in five delicious Autumn colours. 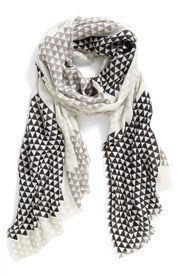 This versatile scarf has a modern geometric pattern, ideal to add a fun touch to your Autumn outfits. The lightweight wool is incredibly soft and not itchy at all. It’s available in three beautiful colourways. I bought the grey one with apple green accents because that shade of green is my colour. 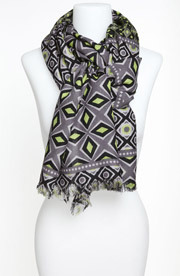 A super fun and stylish scarf with a strong graphic vibe reminiscent of Pantone colour chips. A statement accessory for design lovers. The soft modal fabric feels divine and it’s a great size for different styling options. Available in three fantastic colourways.